Simon Helberg plays 'If You Only Knew' on 'Larry King Now,' telling Larry his funniest fan encounter, person he'd most like to go to lunch with, and his proudest accomplishment. King: Let's play a game of "If You Only Knew" Strangest fan encounter? King: That's a great- best part of being famous? King: Worst part about being famous? Helberg:The worst part is probably the more, you know, it does become harder, I guess, to walk around in, on the street in with my kids and I do like to look at how strange people often are and now I have to hide. King: Marlon Brando told me that actors are better actors when they can observe other people. When they're being observed, it's very hard. King:If not acting, what would you be doing? Helberg: Probably music, I think, yeah. King: You'd have gone further with- you could have been a concert pianist. King: Where did you study? Helberg: Well I only studied through high school. But I played jazz and, and that's- and I love doing that. I love playing rock and doing all them. King: You play operatic stuff in the movie. Helberg: For the movie I had to, I had to learn a whole new genre. Classical and opera. King:Is there something you believed to be true, but wasn't? King: You don't have to answer, it's not a courtroom. Helberg: That- it's so sad. I like to believe in everything. King: If you could have lunch with one person from history, who would it be and where would you take them? King: That would be home to him. King: He would know all the food. Helberg: I would like to just thank him. King: He would get his fill in.If you could switch places with someone for a day, who would it be? Helberg: Switch? Geez, well it would be pretty interesting to, it would be interesting to spend a day in the life of the President, probably. Helberg: Just like to see that. King: Best piece of advice you ever got about Hollywood? Helberg: Somebody said in, when I was in acting school I think it was actually, might have been Frances McDormand. I think said -came into a guest classes and said, "I'm not any better at this than you people, I've just been doing it longer." And there's something very nice about that- that it's, you just put in the work. King: Where did you grow up? Helberg: I grew up in Los Angeles. King: With your impressions, did you wanna do comedy? Helberg: Yeah, I did a lot of sketch comedy. I never wanted to really get on stage and and just talk, but I like playing characters. King: Favorite Big Bang Theory episode? Helberg: Ooh, there is a, well, there's one when they send me to this simulation. They send me to- I have to go to space and then there's this whole program where you we study and they drop in an airplane and I talk about what happened and vomiting and it's- it's a hilarious story about vomit. 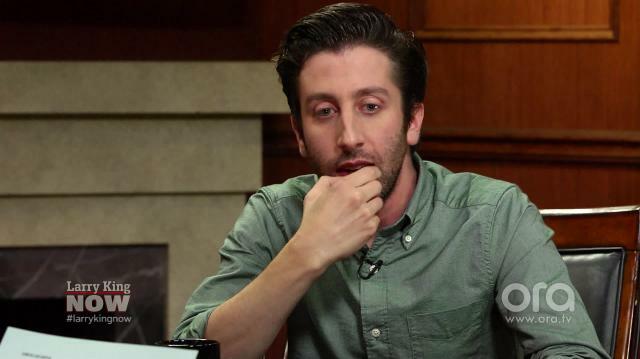 King: Simon Helberg in 10 years? Helberg: Ah, 10 years... I'm hopefully on the beach somewhere just lying there, roasting. King: With residuals, as Big Bang is now in its 40th year syndication.